As a company with an ecommerce front end, we work with various partners and one important partner is the courier company. We have worked with various courier companies and just wanted to share some findings. Obviously, which courier company is the best is a subject of debate and may vary based on location, price flexibility, quality of service requirements and so on. We send a lot of things to remote parts of the country and India Post has by far the best reach. The price is also reasonable. However, unlike other courier companies, they dont really do doorstep delivery - this may be because Postmen in India have cycles and the traditional idea was probably to delivery letters not packages. Whatever be the reason, this is kind of non-negotiable in Ecommerce. You cannot expect customers to come to the Post office to collect their packages, unless they are in really far flung areas. We have had a good relationship with First Flight. They are extremely competitive in two areas - Accessible and ready to get your business. Every Ecommerce business is a customer who will give them consistent revenue - They seem to understand that. The price is pretty good too. However, the deliveries are not as consistent as we expected them to be- Even 5% non-deliveries or late deliveries can kill your ecommerce business and this is one area that needs to be improved. Bluedart in our experience has been extremely consistent-yes, consistent is the word. When you do a ecommerce business, it is important for you to guarantee delivery at a particular date - it may be 3 days it may 7 days, but you should be able to set expectations to the customer and Blue dart is fairly consistent. If it has to go to location x, it will take Y days and most of the time, it works like that. Price is slightly on the higher side but then sometimes you are ready to pay a premium for a service well done. We also worked a bit with Fedex. 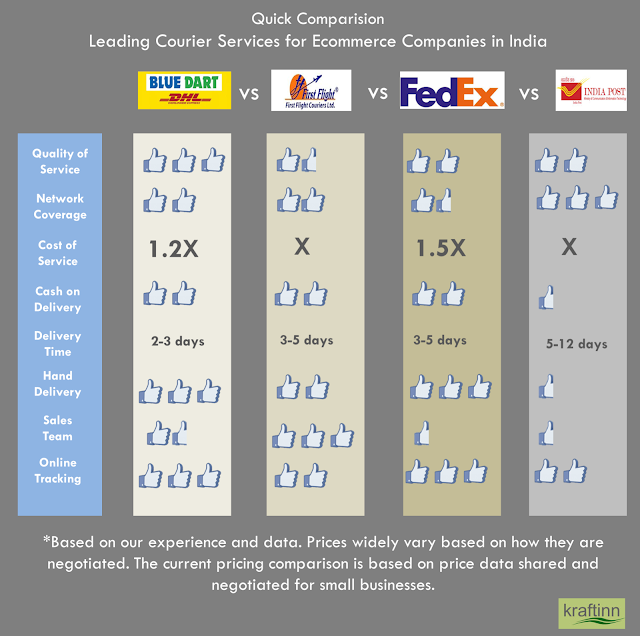 Though service quality is excellent, they still have a lot of differential pricing which is difficult to understand - Too much variable pricing or location based variables results it practical difficulties for ecommerce companies. You want to predict with good accuracy your logistics cost - it should not be a surprise. I called them and talked to the dispatcher, who took down my pickup address, delivery address, and payment details. Then their guy came and picked and delivered the package. I have compared several courier services I have ever used, and in my opinion, ‘Supersonic Sameday UK’ is the best one, and it really does what it promises. I am impressed with its punctuality, as it is known of same day delivery of all parcels and packages. Great post..Thanks for sharing this article with us.Keep posting! !